If you’re in Workforce Management (WFM) or Forecasting long enough, you’ll hear just about everything that doesn’t work when it comes to planning in the contact center. Often bad information gets passed down from analyst to analyst, or people build forecasting models that they love, but aren’t able to be flexible in adjusting the methodology as they grow in the craft, or as the business changes. 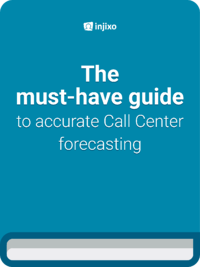 There are some sciences that apply to any contact center forecast. There is absolutely a place for averages in forecasting. If you need a high-level estimate of how many FTE (Full-time Equivalents) you need, you’d take the volume and Average Handle Time (AHT) to determine the workload. However, you cannot stop here. You have to understand what’s happening beneath the surface. If your average has for instance 10% of the population with really low AHT and 90% with moderately high AHT (just above the average), then your average can change significantly, if someone within that 10% leaves the company, or is off sick for a day. If you understand the potential variability here, you can build schedules that take this into consideration. One option is that you may need intervals of overstaffing, that have higher risk, to protect service level. This one happens a lot. If your base requirement is 100 and you have 30% shrinkage, you don’t just multiply the 100 * 1.3 to get 130. The reason behind is that your 30% shrinkage comes off the top. If you take 130, which is what you would staff to, then 30% of 130 is 39 FTE. So you’d lose 39 people to shrinkage and only have 91 to take calls. Consequently, you’ll simply miss your service level. In order to get your staffing number right, you have to divide your total by the inverse of shrinkage. In this case, you take 100 / (1 - 0.30). This formula basically answers the question of “What is 70% of your 100 FTE base. And that’s what you need to solve, because you need to end up with 100 productive FTE after 30% shrinkage. However, keep in mind that usually a WFM platform will allow you to add your shrinkage value before you even build your FTE requirement. Yes, you need to have historical data from the past as vital input for your forecast. But it can’t be all of it. So much can change and you have to consider all the factors that may alter the future to some extent. In terms of contact volume, that can be things within your business such as a new promotion or marketing campaign. In terms of Average Handle Time, you may want to ask yourself if there are any process changes or incentives for agents that can impact this. Is the operations going to manage performance tighter or looser than previously? Are there any benefit changes that may cause higher voluntary attrition? Short and Long-term forecasting use different methodologies. For long term forecasting, you need to look at macro trends, and you’re likely looking at staffing at a high-level. Factors here may include how well the economy is doing, if you’re in a retail contact center. It may also include the number of members your business is planning to add if you’re in an insurance contact center. Long-term forecasts should drive hiring and staffing decisions. Short-term forecasting is focused on more recent trends, and should be updated regularly. As you start to see actual volume come in different than expected, you have to quickly identify the underlying driver. Will it continue? Was it an anomaly? It’s easy to get caught up in completely doing the forecast within WFM. We work with a lot of information, and often the process is extremely complex. 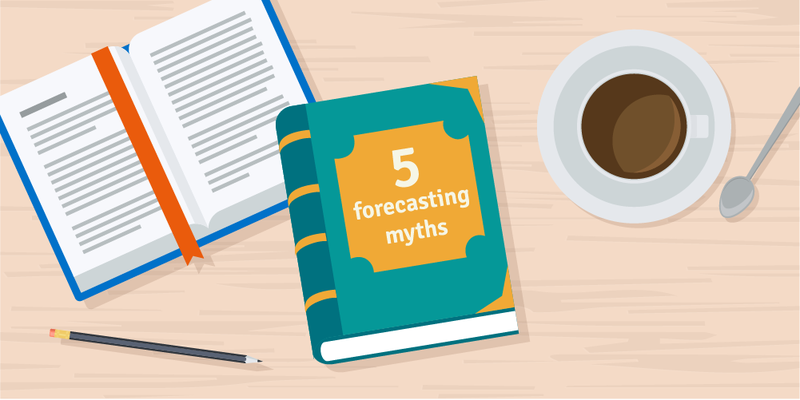 Often, only a few people can actually forecast within the team. However, critical information sits outside the WFM team that helps to build an accurate forecast. You should have regular meetings with other departments that drive volume. Your sales department will have information on expected revenues whereas the marketing department will have insights into initiatives that may drive call volume. Depending on your industry, you may have other volume drivers. 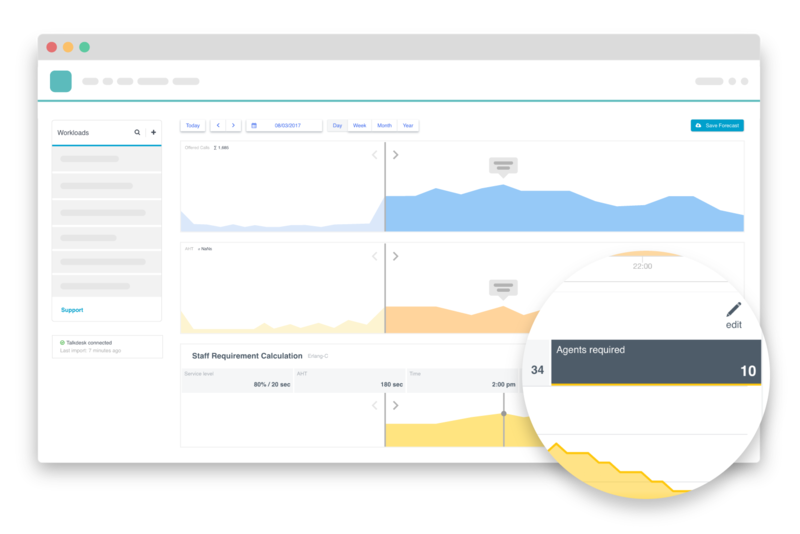 Identify all the drivers to your call volume, and the different departments in your organization that may impact workload. As you forecast, trial-and-error is important. Experiment with different methods and see what gets the best result. Most importantly, measure the actual against the forecast. Build a continuous improvement loop to take learnings in and improve your forecast on an ongoing basis. With self-learning algorithms for the best available forecast. Considers trends, holidays and events. Save up to 75% of your current forecasting time.